Blades is a game I’ve always wanted but never found. A cutthroat grimy heist simulator with some of the most beautiful marriage of crunch/fluff I’ve seen in a game. It’s flashback mechanic is inspired, and the way how you play less as a single person and more as a crew is exceptional. It feels like, in many ways, an expansion of the PBtA system, which you all know Sandy Pug is a fan of! We’ve only designed one supplement in this system so far, but boy is it a good one. Inspired by the electric skating funky vibes of Jet Set Radio, check it out below! *KKkkrtzzrrkkt* The streets of Neo-Toyko are buzzing with the double-shocked electric sounds of thunder-blading street punks blasting their inky-slick art all over every avalible surface, the police ain’t got NOTHING on these cats, and no amount of screaming or cryin’s gonna convince these Bladers to go home until they’re done what they gotta do! Since some of you suckas don’t know, let me tickle your brainstem with some bass-pounding knowledge directly through your eardrum! 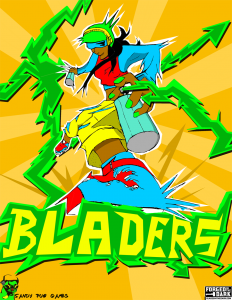 The Bladers is a new full custom crew sheet for use with Blades In The Dark, your crew is a gang of inline skating graffiti punks sharing their sick vibes and out-of-sight art with the world of Nu-Tokyo. Forget stealing or breakin’ stuff, you’re all about creating something special for all the rubbernecking fools down at ground level – Tag high profile targets, race and battle rival crews and stick it to the man as you show this world what you got!